"Just like love, sometimes an idea just runs..."
Lets go back before Door County Creamery was a Creamery. Husband Jesse was cooking around the world after undergrad and culinary school, apprenticing and working in restaurants. 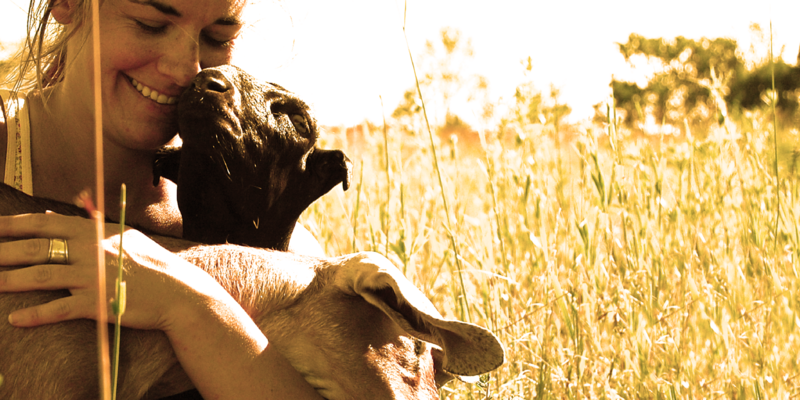 When one day he came across a small goat farmstead in the countryside of Avignon, France. After spending the day with the seemingly unhuman and tireless family, milking goats, making cheese, eating cheese and drinking wine, a moment or a memory had been imprinted deep inside of Jesse somewhere. After returning home he opened the Waterfront Restaurant in Sister Bay with his family where he still creates it's beautiful food along with his team. During that time Wife Rachael had come to Door County with Jesse's sister to work for the summer after grad school. Rachael says "I knew that I was going to marry Jesse when I briefly saw him during a Fall festival weekend the year before, he didn't see me though." "Lets get some goats and make cheese." One night while sitting around talking, Jesse said to Rachael "Lets get some goats and make cheese." A few wispy sketches later of a farm, a piece of cheese and two stick people holding hands under a rock archway the vision was born. Almost instantly Jesse started fencing around the vacant family farm. The barn once housed two female donkey's and their two surprise offspring that his Grandfather, a retired farmer, one day had brought Jesse's Dad, JJ. Rachael and Jesse planned a regional goat research expedition and set off in their brand new Carhartt overalls. The couple visited goat farms, farmsteads and cheese plants. Along the way they learned to hand milk their first goat, see how a milking parlor works, visited a top of the line artisan cheese plant, saw how a farmstead cheese making facility can be economically functional and how the goat community is so supportive of two young kids in crunchy overalls. Jesse soon returned with their first 11 baby goats safe inside of their new cozy home at their farm. Jesse and Rachael were all in now. They cleaned the pens every week with pitch, fork and hay wagon. Tirelessly researching goat health, nutrition and all things goat they prepared for the first Fall breeding and Spring kidding. The Johnson's original 11 goats were made up of the Nubian and La Mancha breeds. Known for their higher butterfat milk, ideal for cheese & gelato making. Soon 11 goats became 30, 30 became 60. Still working their "day jobs" and two short years later Jesse became a licensed cheesemaker and Rachael a soap & gelato master. In 2013 "our dream became a reality..." said Jesse when Door County Creamery opened its doors in downtown Sister Bay helping to spark a town resurgence of fine food, shopping and business community. The Creamery is a cheese making facility, eatery and retail store to sell our cheeses, soap and goat's milk gelato. Jesse and Rachael wanted to give the Door County community the opportunity to fall in love with fresh, local cheeses, just has they have in the French countryside. "Our dream became a reality..."
Rachael and Jesse got married that same Spring and the next winter welcomed a baby boy, July, into the world. With the Creamery growing exponentially over these years Rachael eventually stopped working as a child psychologists at the local schools and Jesse passed more responsibility onto his kitchen at the Waterfront Restaurant. Their days were made up of ... milking goats early in the morning, bringing the milk to the Creamery to make cheese, opening the store and serving lunch, closing the store and then milking the goats in the evening, sleep, repeat. As the herd grew so did the farm. In the beginning they milked on a hand-made stand that only milked four and took three hours twice a day to milk 60. Now milking 130 goats Jesse designed and installed a state of the art milking parlor that can milk 16 goats at one time and takes about an hour. The creamery resides only one mile from the farm, which allows them to source the freshest possible milk. 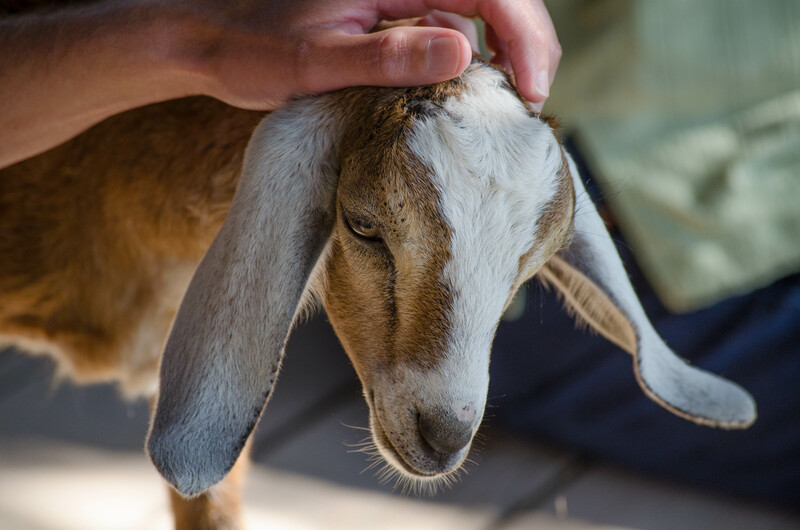 Their beloved goats roam freely in the pasture and are waiting for you to visit them on one of their amazing Farm Lunch Tours. Jesse, Rachael and their growing amazing team carry-on, ensuring that the animals are well looked after and are producing the best goat milk possible. Jesse makes the freshest Chevre you have ever had along with a special cave-aged hard cheese called Falltum. Other hand-made cheeses produced are Farmhouse Bricks, French Fetas, Marinated Feta, Goat Cheddars, Fresh Cheese Curds and other seasonal cheeses. When you come to the creamery you may just spot Jesse through the production room doors making cheese or Rachael with a friendly smile welcoming you to their home. Please stop by to say hello and share our life with you. "Newlyweds happy raising goats, making cheese." Watch Door County Creamery's Wisconsin Foodie's episode about them.